Which Kind of Invitation Paper Should You Choose? Choosing the right invitation paper is the most important decision you will make when you make your own invitations. There are many options to choose from. Some papers may make the process a lot easier but may not look as pleasing to the eye. While other papers may give your invitations an absolutely lovely, polished look but are harder to work with. The most basic paper of all would be your generic printer/copy paper. In printing or copy shops when they refer a specific kind of paper they refer to the weight of the paper. The most generic kind of paper is a 20.lb paper stock. If you prefer just a slightly heavier textured paper you would ask for 25 lb. paper stock.There are other weights but these are the most common. The next step up from there is cardstock or 65 lb. paper. This is a popular selection to use when you make your own invitations. The name "cardstock" speaks for itself on this matter. This is a definite choice if you are planning on making postcard invitations as it is stiffer and will not bend as easily when sent through the mail. In my opinion this paper can be used for any invitation and makes a great base as well. If you wanted to go just a little heavier than that you could go for a 110 lb. cardstock. The only downside I can see with choosing to use a cardstock as your invitation paper is that if you plan to fold the card in half, you may need to have the paper scored (scoring is to make an indention in the paper using a scoring tool. The indention causes the paper to fold neatly) where you intend to fold it. Without doing this you may not achieve a clean fold, and it can look very messy. If the cardstock you choose is more on the flimsy side you may be able to get away with folding the invites by hand without scoring by going over the fold with a flat edge. I do this using a good wooden ruler. First make the fold. Then lay the folded card down flat and use the edge of the ruler to go over the fold again. This will usually remedy the problem of a wrinkly or messy looking fold as it kind of irons the wrinkles out. This option would be that of simply purchasing blank invitation paper. No, not the kind that is a blank invitation intended for you to fill out. These days if you go to any major office supply store they have a full selection of printer papers to choose from. Here you will find blank invitation paper in different colored and textured cardstocks. They are already cut to the size of the envelopes, and scored on the fold as well. Some are even embossed with shapes like flowers and leaves.All you need is simply to load them into your printer (or bring them to a local copy center) and print straight onto them. That's it! Done! Unless your like I am and have to go even more elaborate to add ribbons, fancy paper, or some other embellishment. At these same office supply stores you will find an array of specialty printer papers which are also worthy of your invitations. At these same office supply stores you will find an array of specialty printer papers which are also worthy of your invitations. They will mostly come in the standard size 8 1/2" by 11" but will come in many different colors and patterns. Yet another paper found at any office supply or stationery stores are 100% cotton papers. These are the best to pair with invitations for formal events. They also come in a variety of colors and usually sport a watermark. When printing on these make sure and print or copy onto them keeping the watermark facing in the correct direction. If you are looking for something with a little more pizzaz, then head on over to the local craft supply store. At most major craft supplies they now have an entire shopping aisle dedicated to scrapbooking. This is also the aisle where you will usually find a HUGE selection of scrapbooking papers in many different colors and patterns. They can be a little expensive, and alot of the time you will need to buy them by the sheet but it is well worth it. If you're lucky you will hit a good sale when dealing with the larger arts and crafts chains. The papers go on sale all the time. Just last week I hit a sale where all of the scrapbook papers were 40% off. Of course I went nuts buying them all up! These papers will also come in many different textures. This will not come in handy if you are looking to print directly onto them, but on the creative side of making your own invitations, these papers do the job. I like to use these papers to do a little layering. You can print your words on a different kind of paper, then layer it onto the textured paper! You will see some examples of this elsewhere on the site. Another downside to using this kind of invitation paper is that alot of these papers come in an odd size so you will need to have them cut down to the size you wish to use. If you choose to cut them yourself many of these papers have a grid printed onto the back of them for easy measuring. You can have them cut fairly inexpensively at you local copy center or print shop. The last invitation paper I will cover is the handmade or hand crafted paper. These papers are very elegant! You will need to find a specialty store or local artist to get your hands on these papers. The downside for these papers are that because of the texture of them, they cannot be printed onto, so you will have to find a way to get creative with them. But whatever the finished product turns out to be it will look beautiful. 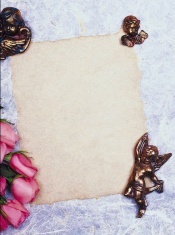 My tip for these kind of papers is to embellish them with any kind of dried or pressed flowers and top it off with a ribbon.